Now, there’s always a sense of occasion when you see a Ferrari. And, in this case, between the gleaming Modena yellow paint, the red cam covers that you can see through the transparent engine cover, and just the overall silhouette of the car, it all just screams supercar – not to mention the mid-engine layout. 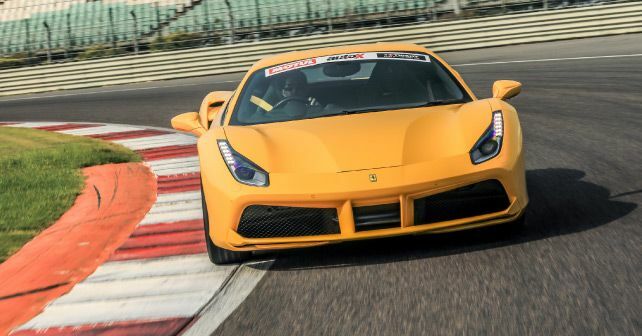 Frankly, despite some very impressive machines in this test, it was always expected that the Ferrari would be the fastest car here – and, as such, take the ‘Performance Car of the Year’ honours. After all, the 3.9-litre twin-turbo V8 in the 488 has won the overall International Engine of the Year award for the past three years running. And that’s to say nothing of this exceptional chassis. It’s just such an easy car to push to the limit. This machine allows you to take liberties with it from behind the wheel, unlike Ferraris of yore. You can brake SO late, and carry SO much speed through corners that it’s almost laughable. Laughable. And easy. And oh so very enjoyable. So, purely for its sense of occasion, and for so effortlessly pushing the boundaries, does the 488 GTB wholeheartedly deserve the performance award this year. This is a car that grabs the trophy purely on merit – and grabs it with eight screaming cylinders.